NEW ORLEANS: The fringes of potentially catastrophic Hurricane Katrina began whipping Louisiana today as about 1 million people fled from the low-lying New Orleans area. The brunt of Katrina, which had 265kmh winds on Sunday evening, was expected to crash ashore around sunrise on Monday (about 10pm NZT). Its winds, tides and heavy squalls had already started arriving before nightfall. The storm had weakened slightly from the morning, when it boasted 280kmh winds, but it remained a savage Category 5 storm on the five-step Saffir-Simpson scale. Mayor Ray Nagin warned the hurricane's storm surge of up to 8.5m could topple the levees protecting the city, which sits in a bowl-shaped area, and flood its historic French Quarter. "Ladies and gentlemen, I wish I had better news for you but we are facing a storm that most of us have feared," Nagin told a news conference after reading out a mandatory evacuation order. "This is a threat that we've never faced before." An estimated 1 million of the area's 1.3 million people were believed to have evacuated, emergency officials in nearby Jefferson Parish said. Some of those unable or unwilling to flee piled into the Louisiana Superdome, New Orleans' enclosed sports stadium. Nagin, appearing on Larry King Live on CNN, said by Sunday night about 25,000 people had gathered in the 72,000-seat stadium, which he called "the shelter of last resort." "This is an unprecedented storm with incredible power," Nagin said on CNN. Several roads were turned one-way outbound to speed the evacuation and Louisianians lined up at gasoline stations and convenience stores to buy water and other supplies. In the French Quarter, shopkeepers sandbagged art galleries and boarded up bars and restaurants in preparation for the storm. Police and fire officials took to the streets with bullhorns, alerting residents of the coming danger. Only two of the dozens of bars along notorious Bourbon St remained open, serving stragglers who wanted to squeeze in a last bit of revelry before Katrina barreled in. Offshore, the hurricane forced energy companies to evacuate personnel and shut platforms in its path. The US Gulf of Mexico is home to 25 per cent of the nation's domestic oil and gas output and widespread damage to facilities was possible. US crude futures had jumped about 5 per cent to $US69.65 a barrel after briefly touching a record high of $US70.80 as traders reacted to lost production and fear of damage. Unleaded gasoline futures were up around 8 per cent to $US1.99 a gallon. Katrina also endangered the port serving New Orleans, one of the most important in the world, and could do billions in damage to the city's tourism infrastructure. 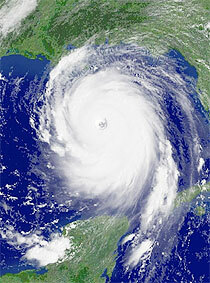 Max Mayfield, director of the US National Hurricane Centre, described Katrina as a "perfect" hurricane. It was positioned about 210km south of the mouth of the Mississippi River at 8pm EDT (noon NZT) on Sunday, the Miami-based US National Hurricane Centre said. The storm also began an expected right turn and was steaming north-northwest at 18kmh. Hurricane force winds could be felt 170km out from the centre, just offshore, and tropical storm-force winds were blowing well inland. The Waterford nuclear power plant, 30km miles west of New Orleans, was shut down as a precautionary measure. Katrina had a central pressure - a measure of a storm's intensity - of 904 millibars, which would make it one of the four strongest storms on record. The Labour Day hurricane of 1935 that hit the Florida Keys, killing some 600 people, was the strongest with a minimum central pressure of 892 millibars on landfall. Mississippi and Alabama also braced for impact as the wide hurricane was forecast to push a 6.1m surge of seawater into the tourist community of Gulfport, Mississippi. Tourists on the Gulf Coast scrambled to join the exodus but many were left trapped as rental cars were snapped up quickly. Authorities in New Orleans said they would commandeer vehicles and private buildings if necessary. "About all you can do at this point is pack the car with as much as you can carry, place the rest of your belongings as high in the house as you can and then get the heck out of here," said Cathe Jackson, whose house is one block from the water in Biloxi, a casino-resort town on Mississippi's coast. US President George W Bush declared an emergency in Louisiana, Mississippi and Alabama and a major disaster in Florida, where a weaker Katrina caused damage around the Miami area last week and killed seven people. The declarations allow federal aid to be deployed. "We will do everything in our power to help the people and communities affected by this storm," Bush said from his ranch in Crawford, Texas. "We cannot stress enough the danger this hurricane poses to Gulf Coast communities." New Orleans has not been hit directly by a hurricane since 1965 when Hurricane Betsy blew in, flooding the city and killing about 75 people in the United States. The last Category 5 to strike the area was Hurricane Camille in 1969. Camille, which just missed New Orleans but devastated parts of Mississippi, Louisiana and Alabama, killing more than 250 people. Hurricane Andrew, which destroyed the city of Homestead south of Miami in 1992 and ranks as the costliest natural disaster in US history, also was a Category 5.